Home Tutorials Social Signals: Analysing Activities on Facebook, Twitter, & Co.
Social Signals: Analysing Activities on Facebook, Twitter, & Co.
Social Signals have gained an increasing significance for online marketing over the past years – they are signals that, to an extent, provide a measurable value for the range a website has on social networks like Twitter, Facebook, Google+, Pinterest & Co. With the SISTRIX Toolbox you can analyse the activities on the most important networks and use this data for a variety of applications. After you login in to the SISTRIX Toolbox, please type a domain into the search bar. Afterwards, click on the “Social-Signals > Overview” in the left hand navigation. You are now on the overview of the social signals module for the domain you are looking at and can get a first impression on the activities are distributed along the different networks. In the course of the overview page you can find the the Social Signals history for the domain. Below are two pie charts on the distribution of data on the different networks and by the type of interactions. Telekom is strongly geared towards Facebook and Twitter. On both portals a team of supporters will answer consumer questions. Comparibg Facebook and Twitter, Mark Zuckerberg’s network clearly dominates. We also provide you with an extract from the top URLs in the next table. You can take a closer look at this data for each network in the left hand navigation. In the overview the numbers for all networks are summed up, giving you a direct overview of the most “discussed” contents (in absoulte terms) on social networks. As you have probably already noticed, Telekom is especially inactive on two networks, LinkedIn and Pinterest. Learnings like these, are usually quickly gained by using the Social Signals module and you should always have a look at this module for your competitors’ domains as well. As far as Pinterest and LinkedIn are concerned, it can actually be a great idea to invest in these nethworks, depending on the industry and target group you are catering to. Let us have a closer look at the details of a URL. To do this, please click on the small plus-symbol at the end of the row of one URL. You are now on the overview-page for the selected URL. The site is set up similarily to the general overview. At the top you can see the selected URL. Below, you have the history graph. For this example Telekom URL we can nicely see how the URL continuously gained attention on Facebook. Additionally, the URL is also quite present on Twitter. Google+ seems to be rather uninteresting in this context, and the other networks are simply inactive. You already know the next two boxes, too. Only now, the data is entirely focused on the URL. This lets you quickly determine where the activity for this URL is happening. For this example we notice that a lot of comments are left on the social networks. The URL is being shared more often than liked on networks. At the end, you can get a picture of the course of interactions on the different networks using the table. In this table you can easily observe that Twitter and Google+ currently do not show additional growth of social signals. 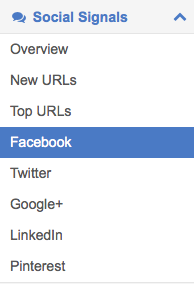 Facebook, on the other hand, shows new activity on almost a daily basis for this URL. In the left hand navigation you can always look at the top URLs of the specific networks. At the moment, Facebook, Twitter, Google+, LinkedIn, and Pinterest are available. For Facebook, you have access to data for likes, shares, and comments. For the other networks we always sum up the interactions. 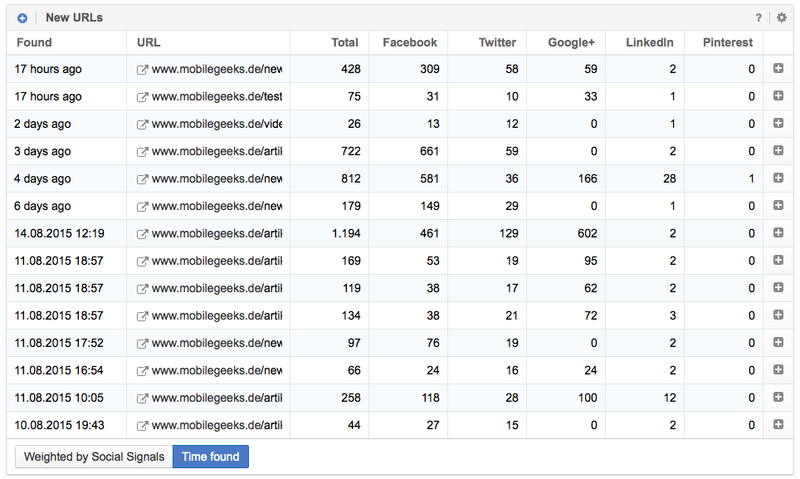 For this example we will use the domain mobilegeeks.de, to get more current data. You reach the section “New URLs” using the left hand navigation. These are especially interesting if you work a lot with social networks yourself or if your competitors do so, because here you can often first find new content on a domain. You can change the way the table is sorted at the bottom of the page, where you have two buttons. To always get the current data first, please select “Time found”. The table on the picture above is also sorted this way. With this module you can get an overview of any domain’s activities on social networks. In the detailed-analysis you can find out how well a specific URL is spreading on Facebook & Co. Daily updates of the data allows you to observe the growth of social signals promptly and in great detail. The module also helps you observe your competitors. If you add the “New URLs” of your competitors to a dashboard or in a report, you will always be up to date concerning the newest changes of these websites. You can learn more about the dashboards in our tutorial “Creating overviews with dashboards“, while we cover the reports in the tutorial “PDF-Reports: Configuration & Adjustments“.